September 2019 marks the 80th anniversary of the outbreak of the Second World War and after five years of special events, exhibitions and projects to commemorate the First World War this book looks at the long military history of the county of Norfolk from its early fortifications and conflicts between the Iceni and the Roman occupiers right up to the end of the Second World War, hopefully there will be many stories and images that will be new to the reader, even if they have enjoyed studying local military history for many years. That's the enduring grip such a subject has on a historian, there is always something new to discover, even if you think you know a subject well. Norfolk is one of England's largest counties, it still has thousands of acres of rich, fertile agricultural land and has had human settlements since the earliest times, along with their resulting conflicts. Add to this a coastline stretching nearly 100 miles from The Wash to Hopton-on-Sea with a number of natural harbours and navigable waterways and dear old Norfolk has been a target for raids and invasions down the centuries too. Perhaps these are some of the reasons why Norfolk people have a natural propensity for standing up for themselves and what they believe is right. 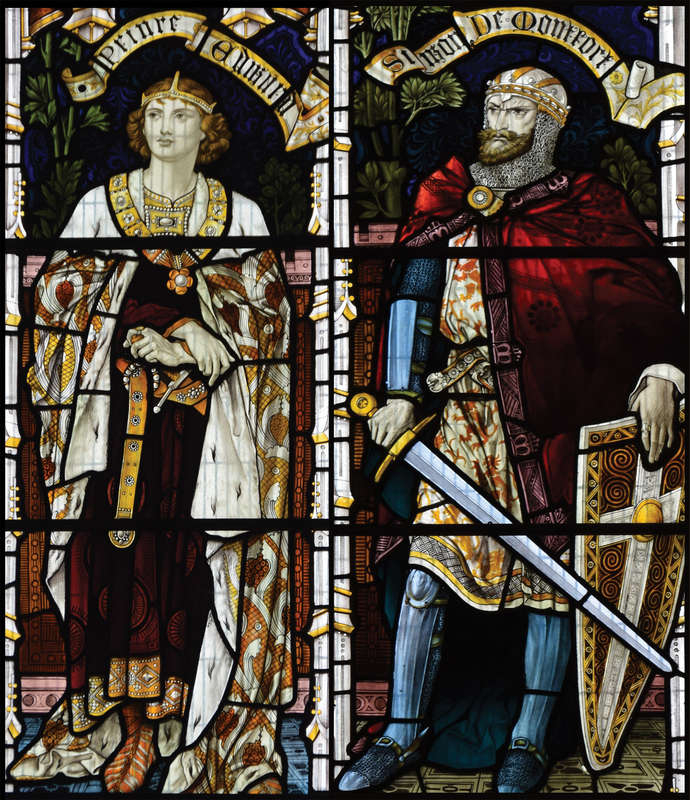 Famously, in ancient history the Iceni were led in battle by Queen Boudica in a campaign that almost drove the Roman occupiers out of the British Isles and that fighting spirit remains in the blood, mingled with that of the Saxons, Vikings and Normans. 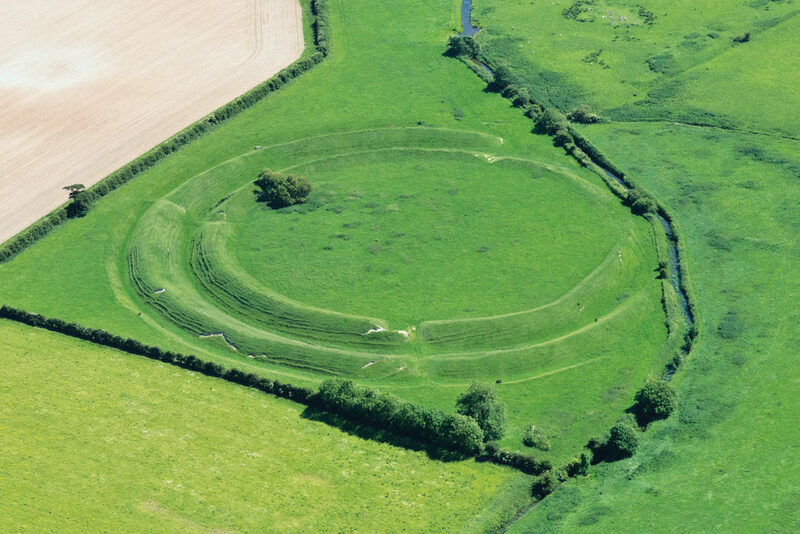 I wanted to show a variety of perspectives of the earliest fortifications, not just those visible at ground level and John Stevens kindly allowed me to use some of his brilliant aerial photographs of Norfolk's remarkable early fortifications such as the Warham 'Ring,' Burgh Castle and Castle Acre, and even took a few more especially for the book. Notably, during our exceptionally dry summer of 2018 the marks of the ancient roads buildings and walls of Venta Icenorum the Roman administrative centre that was established over the old Iceni settlement at Caister St Edmunds, had not been quite so clearly seen for years and having seen many of the old images of the site in black and white from when it was first discovered it was great to see them in colour at last. Norfolk people have risen in rebellion on numerous occasions against oppression and to defend their way of life, notably during the Peasant's Revolt in 1381 and Kett's Rebellion of 1549. Ultimately they faced forces that were larger and far better armed than them but rise they did and made their point. 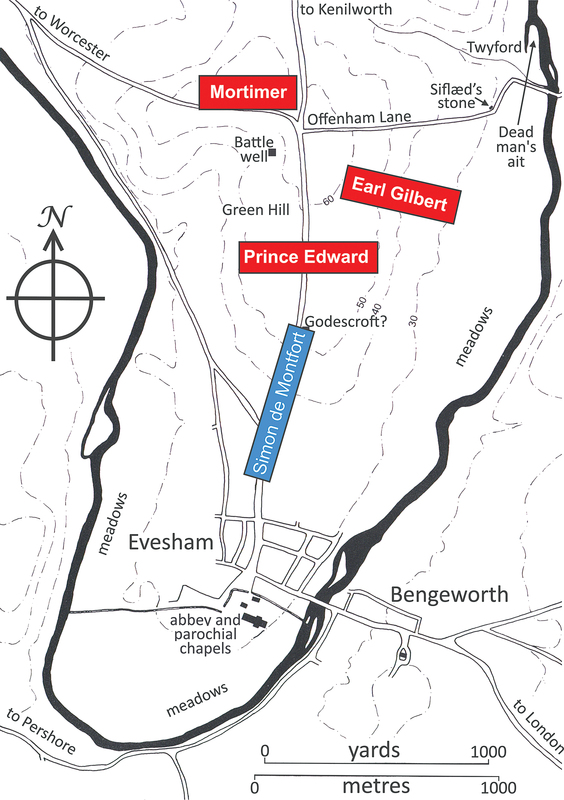 During the English Civil War despite being predominantly in favour of the Parliamentary cause both Royalists and Parliamentarians made their stands in the county and many Norfolk men joined Regiments that fought in some of the notable actions of the war around the country. Captain Robert Swallow raised the 'Maiden Troop'of Cromwell's Ironside cavalry in Norwich and ultimately Norfolk formed part of the Eastern Association which proved to be the backbone of the Parliamentarian forces by late 1644. 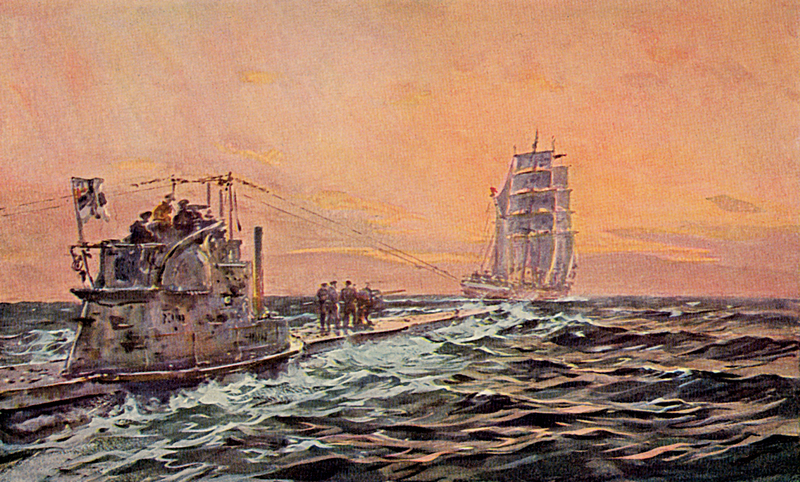 This spirit is also reflected through the service of Norfolk personnel in the Royal Navy, in the Royal Air Force and even among those on the home front through dark times, danger and disaster. The veterans many of us knew from the First World War are now all gone and sadly those who answered the call on both the home front and on active service during the Second World War are fading away too. I hope, in some small way, this book will encourage new generations to appreciate their experiences and sacrifices and will provide inspiration and a good starting point for future research. 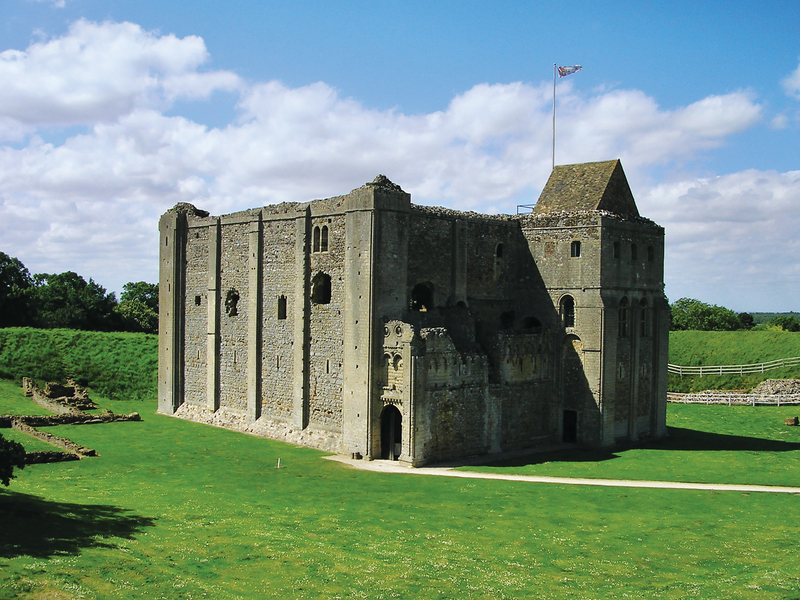 Norfolk has been the scene of riots, rebellions, sieges and military actions over past centuries and the landscape is dotted with earthworks, defences, moats, fortified manor houses and latterly pillboxes and other fixed defences from the First and the Second World Wars. Some of these are now long gone, others are ruins and some remain remarkable bastions to this day. This book does not attempt to be encyclopaedic but I hope it will highlight some of the most interesting places and inspire a visit to those open to the public. 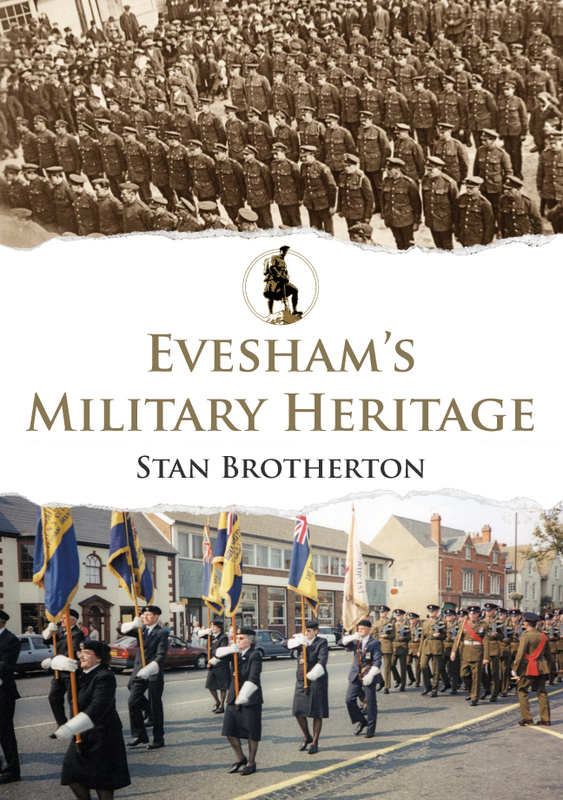 Above all I hope it will introduce the story of our local regiments and our military past to anyone with a budding interest in the subject be they Norfolk born and bred, resident or visitor and deepen their appreciation of Norfolk's rich military heritage. 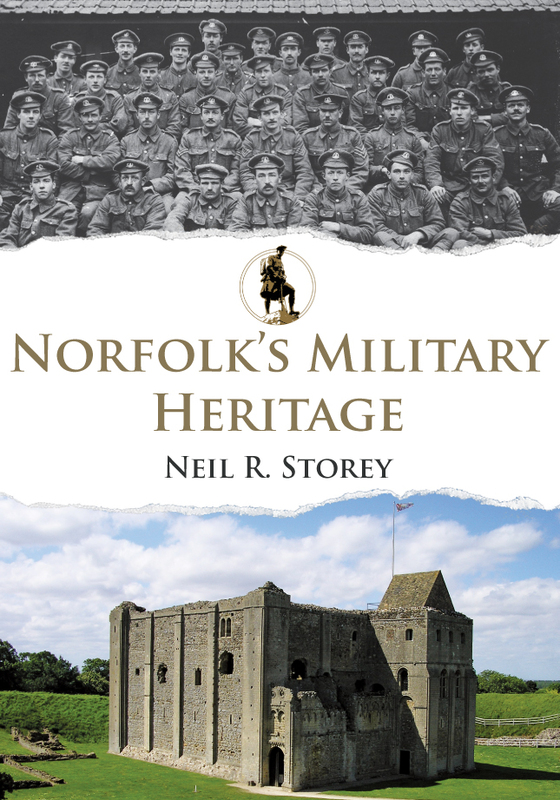 Neil R. Storey's new book Norfolk's Military Heritage is available for purchase now. 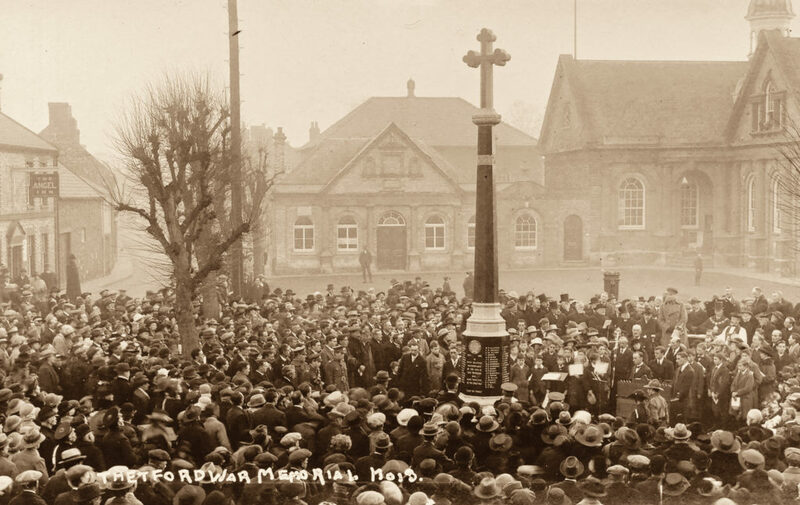 This entry was posted in Blog and tagged Saxons, Norfolk's Military Heritage, Normans, Norfolk, Vikings, Ancient history, Military Heritage Series, Neil R. Storey, First World War, Romans, Second World War, Local History, Military History, Amberley Publishing on April 10, 2019 by Amberley Publishing. Stanley Elton Hollis was born on Teesside in 1912, so he was in his thirties when he landed on Gold Beach with 6th Battalion Green Howards. His battalion had trained hard up by Inverary on Scotland’s hard north-west coast. Reveille on 6th June for the Green Howards was around 02.30 with a decent breakfast for those who had the stomach. Getting down via the nets into the landing craft wasn’t easy; the violent pitching of both vessels and the ungainly weight of kit wasn’t conducive to smoothness. If the motion of the ship was bad, this was much worse and the laden bobbing craft had to cruise around in circles, till like a line of ducks they set off in line abreast, ‘A’ Company on the left and ‘B’ on the right. Stan identified a German strongpoint dead ahead as they cruised in to land, (in fact it was a railway shelter), and grabbing a Lewis gun he rattled off a full pan of ammo. The gun was stripped of its water cooling jacket and, as he hefted it clear of the bracket, forgetting it would be red hot by now, he badly blistered his hand! The plan called for Stan to lead mortar-men and Bren gunners from each platoon to charge ahead and set up at the high water mark, providing smoke and covering fire to get the rest through the belt of mines ahead. On their right a tank brewed up, one of ours obviously and the turret hatch bowled along the sand, a lethal projectile but no-one was hurt. Up the beach and onto a low ridge of dunes festooned with thick wire entanglements. Birds were sitting apparently unconcerned on the coils. One wag suggested they had no choice as there wasn’t any room left in the sky. Ahead now was a dense belt of mines. ‘D’ company were first through after their assault engineers had gapped, Stan and the others followed the reassuring lines of white tape. Beyond the minefield lay Meuvaines ridge and Mont Fleury Batteries. Once through the hedge beyond the belt of mines, the Green Howards were fully exposed to the attention of the German defenders dug in on the higher ground. Inch by fire swept inch they crawled forward, Major Lofthouse had spotted the pillbox that was doing most of the damage. 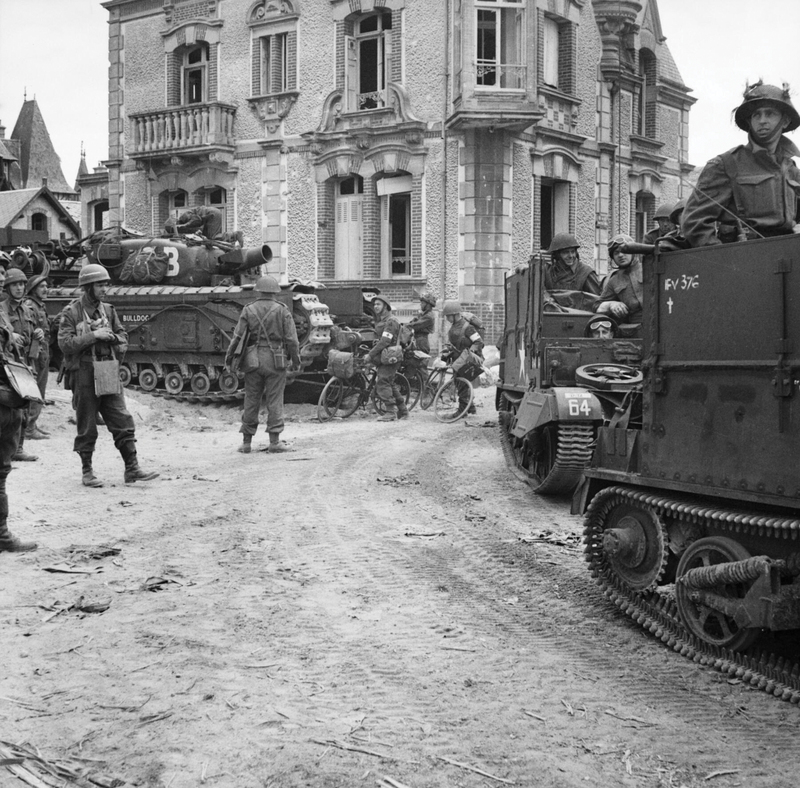 Hollis saw it too and stormed forward his Sten chattering, he made it and lobbed a grenade in, killing two defenders and persuading the rest to give. 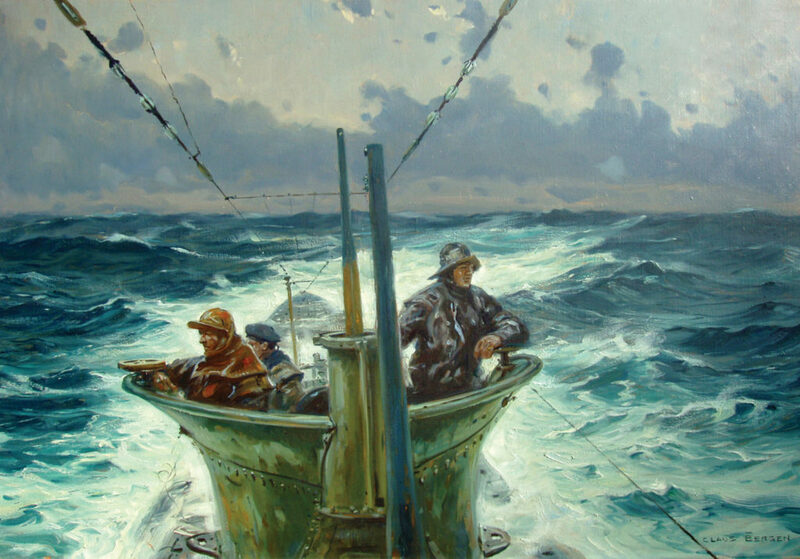 He barged ahead, up a shallow communications trench aiming for a larger bunker whose inhabitants went into the bag ‘about eighteen or twenty’. A pretty decent haul and it turned out these were the fire control team for the battery up ahead. 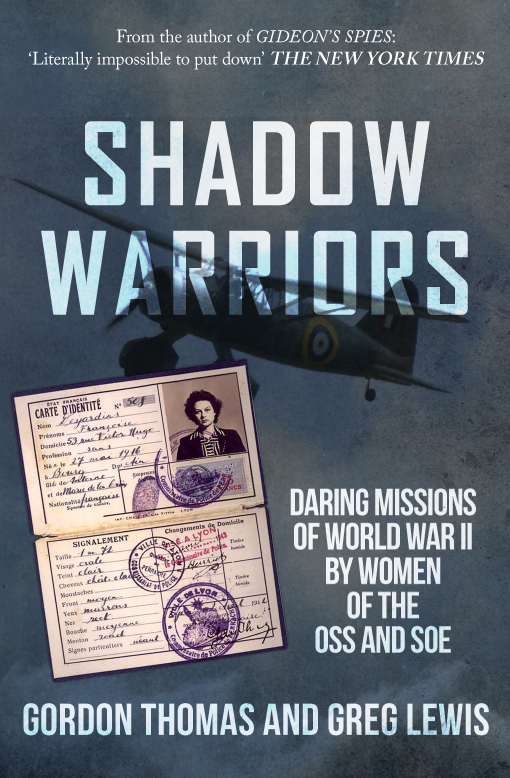 It was only 09.30 and they could see enemy bolting from their positions but not that far, falling back behind a sheltering wall and firing. Hollis saw one German crazily loping along the top of the wall. Swapping his Sten for an Enfield rifle, he brought the fellow down first shot but was lightly wounded in the face just after. On they went into the village of Crepon. With Lieutenant Patrick now dead, Stan was commanding 16 Platoon and the Major ordered the company to check/clear the several farmhouses lining the approach road. 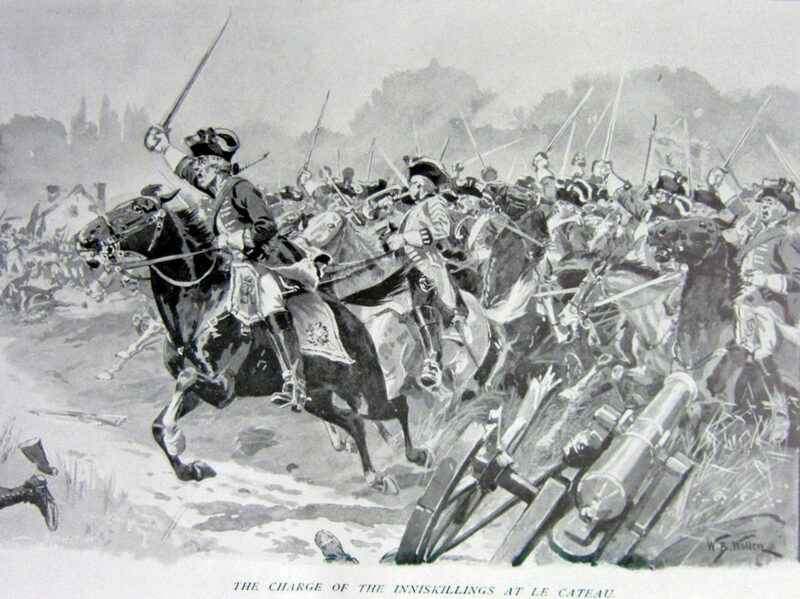 Stan broke and entered one of the silent steadings; it seemed deserted except for one terrified boy, perhaps ten or eleven, the effect of seeing this ferocious, blood garnished veteran bursting in must have been utterly terrifying. As he came out to check the rear an enemy round smacked off the back yard wall, fragments whizzing. Aside from a pair of excited local canines, he could just about make out an enemy gun. His day was far from over. 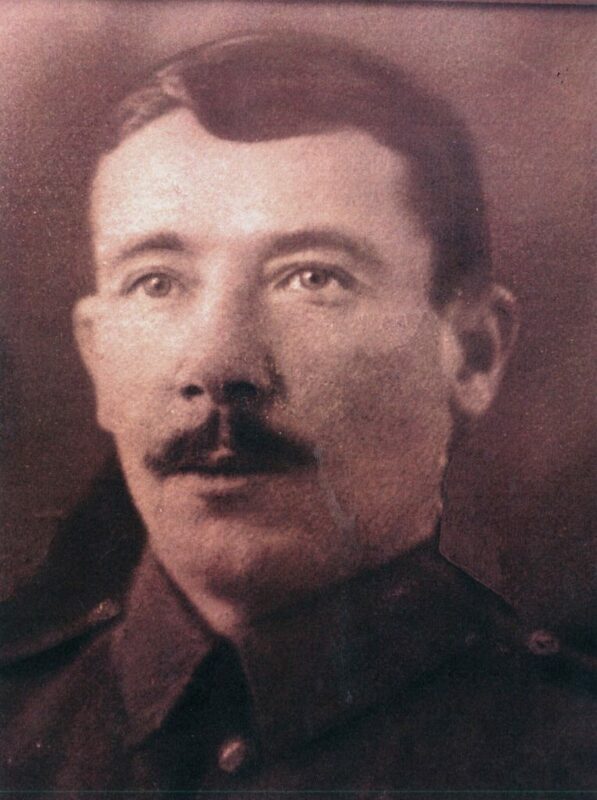 Stan Hollis won the VC for his actions, the only one to be awarded on D-day. 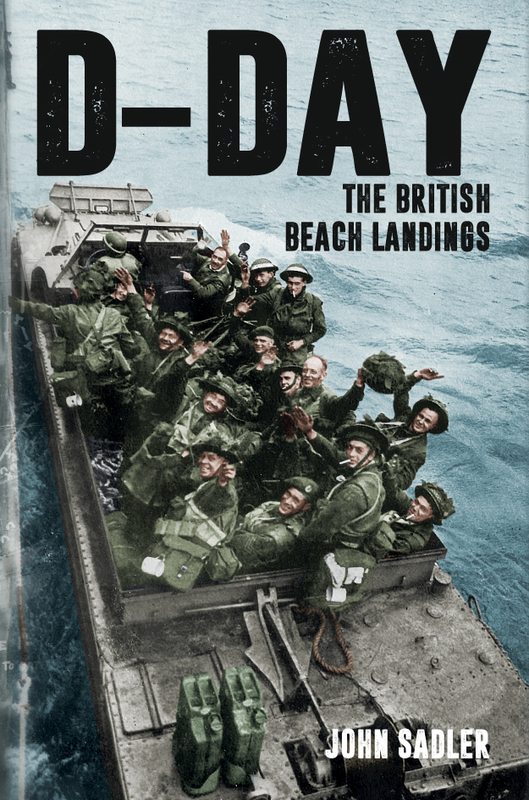 John Sadler's new book D-Day: The British Beach Landings is available for purchase now. 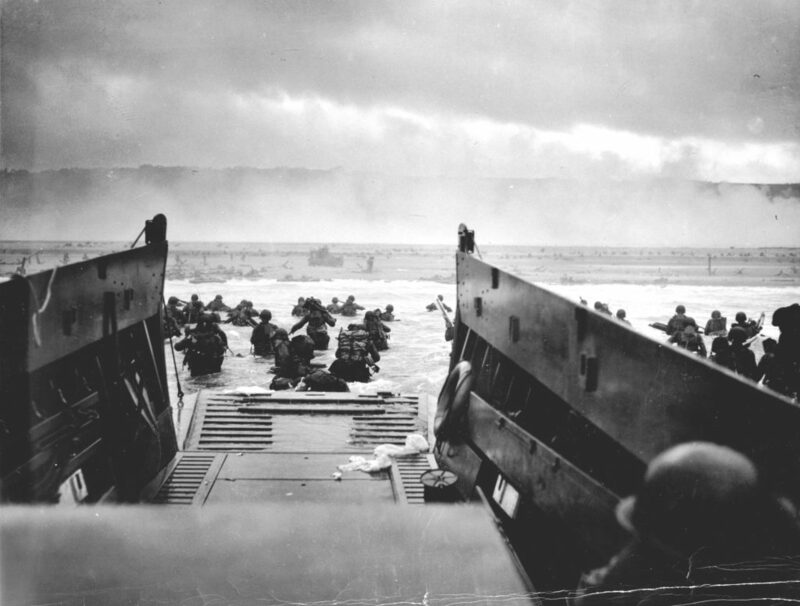 This entry was posted in Blog and tagged Operation Overlord, Stan Hollis, The British Beach Landings, D-Day, John Sadler, D-Day: The British Beach Landings, Second World War, World War Two, Military History, Amberley Publishing on April 2, 2019 by Amberley Publishing. The Royal Dragoon Guards are one of the oldest, and most prestigious, regiments in the British Army. Although the modern-day regiment was formed in 1992, its antecedents can trace their history back to the 1660s, representing over 350 years of continuous service. Those regiments which make up the regiment were the 4th Royal Irish Dragoon Guards; 5th (Princess Charlotte of Wales’s) Dragoon Guards; 7th (The Princess Royal’s) Dragoon Guards and the Inniskilling Dragoons. 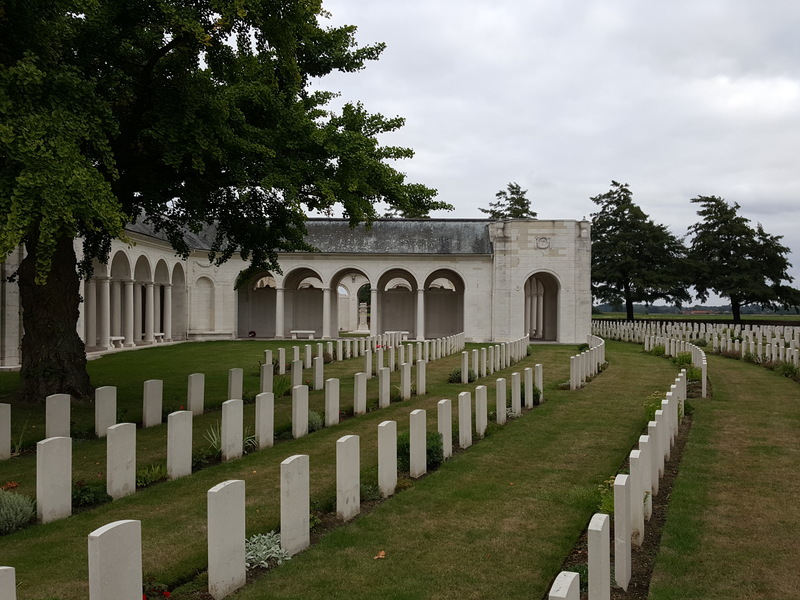 They have a proud lineage – battle honours including Blenheim; Dettingen; Peninsular; Waterloo (where Corporal Penfold of the Inniskillings claimed to have captured a French Eagle); Balaklava (the more successful Charge of the Heavy Brigade) and Mons. Amongst those who have served are Robert Baden Powell, the ‘father’ of the Boy Scouts who was the youngest colonel in the British Army when he assumed command of the 5th Dragoon Guards, and Captain Lawrence Oates of the Inniskilling Dragoons who took part in Captain Scott’s ill-fated Antarctic Expedition in 1912. But, after 250 years of independent service, reductions following the Great War in 1922 saw the 4th and 7th Dragoon Guards amalgamated to create a new regiment with its own traditions the 4th/7th Dragoon Guards. The Inniskillings and 5th Dragoon Guards were also amalgamated to become the 5th/6th Dragoons in the same year, and in 1935 gained the accolade 5th Royal Inniskilling Dragoon Guards. With such a long history, The Royal Dragoon Guards have amassed one of the finest regimental collections in the country, housed in York Army Museum, in the shadow of the Clifford’s Tower in the centre of York. The museum curates collections not only from the Royal Dragoon Guards but also The Yorkshire Regiment, caring for and celebrating the history and special connection between the people of Yorkshire and the army, serving on every continent on the globe. 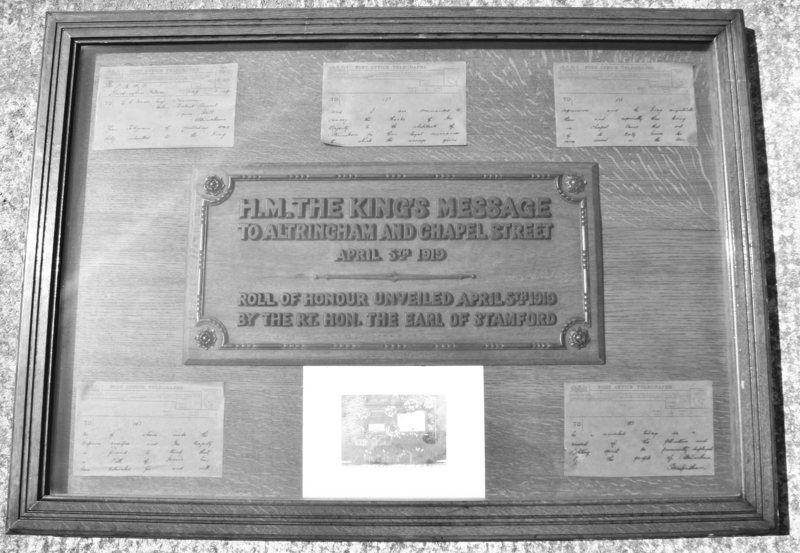 The service of the Inniskilling Dragoons, together with that of the Royal Inniskilling Fusiliers, is remembered in Ireland at Enniskillen Castle. Both museums are well worth a visit, with knowledgeable and helpful staff, and interesting temporary exhibitions. 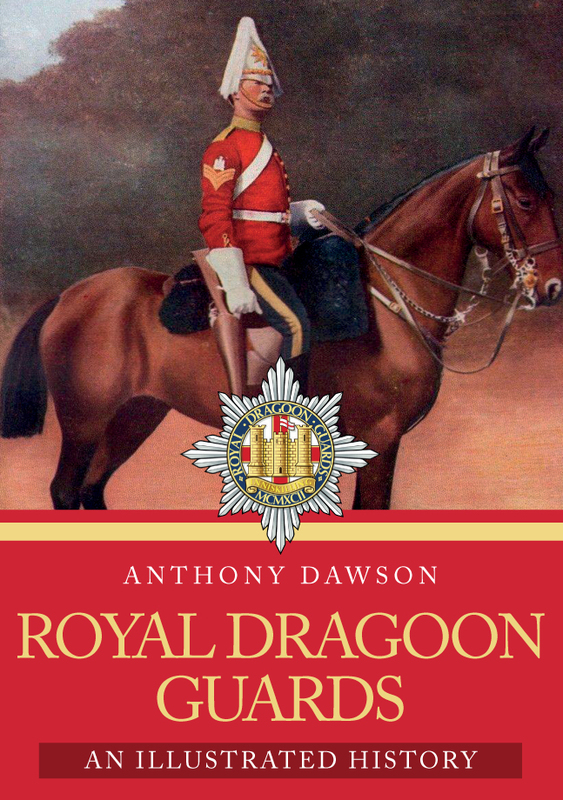 Anthony Dawson's new book Royal Dragoon Guards is available for purchase now. 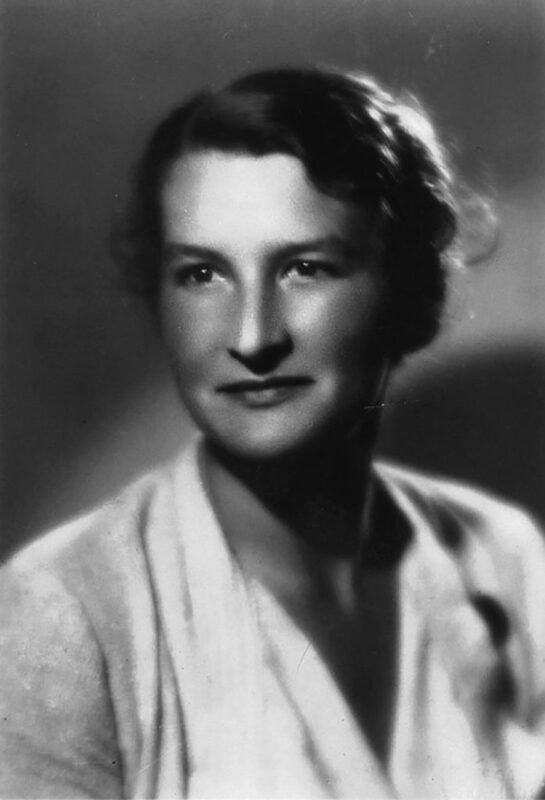 This entry was posted in Blog and tagged Journals, Diaries, Dragoon Guards, Royal Dragoon Guards, Letters, Anthony Dawson, Military History, Amberley Publishing on March 1, 2019 by Amberley Publishing. The German surprise attack on the Soviet Union began before dawn on 22 July 1941. Oberleutnant Gűnther Scholz, Staffelkapitän 7/JG 54 recalled this historical day: ‘On 22 June 1941 in the early morning at 03h00 the first intrusion over the Soviet border took place; our target was the airbases near Kowno. I will never forget flying over the border. As far as one could see from our height of approximately 2,000 m in the emerging dawn, to the north and to the south, white and red Very lights were ascending high into the sky and army units on the ground and fliers in the air crossed the border punctually at 03h00.’ Tactical surprise was achieved in massed attacks on Soviet air bases, the exultant pilots claiming 1,489 aircraft destroyed on the ground, 322 in the air as the Russians responded. As always in aerial combat, actual losses (864 ground, 336 air) didn’t match claims made. These were catastrophic losses, and the Russians would continue to suffer grievous losses for a long time, but they never stopped fighting. Often their stubborn resistance, their continued advance towards targets as their bomber formations were shot to ribbons, were seen as stur (pig-headed) and stupid, characteristics typical of Untermenschen as many of the Germans saw them. 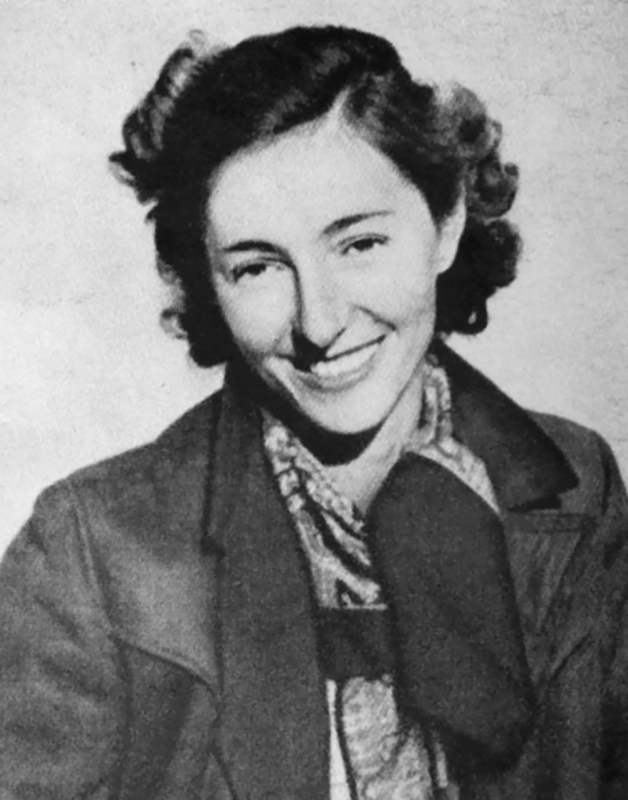 Many German Jagdflieger were highly experienced, with campaigns from Poland to the Balkans behind them, as well as the sobering defeat of the Battle of Britain. Fighter pilots are aggressive and often ambitious, and the lure of success, high decorations and joining the panoply of propaganda heroes of the Third Reich kept many of them focussed. Their victory claims soon mushroomed and as the Russian campaign went on, the envelope of the top scorers exceeded first 100, then successively 150, 200, 250 and even 300, Hartmann their top ace achieving an incredible 352 claimed successes. The German fighter pilots in the East were thus the top scorers not only of the war, but of all time. 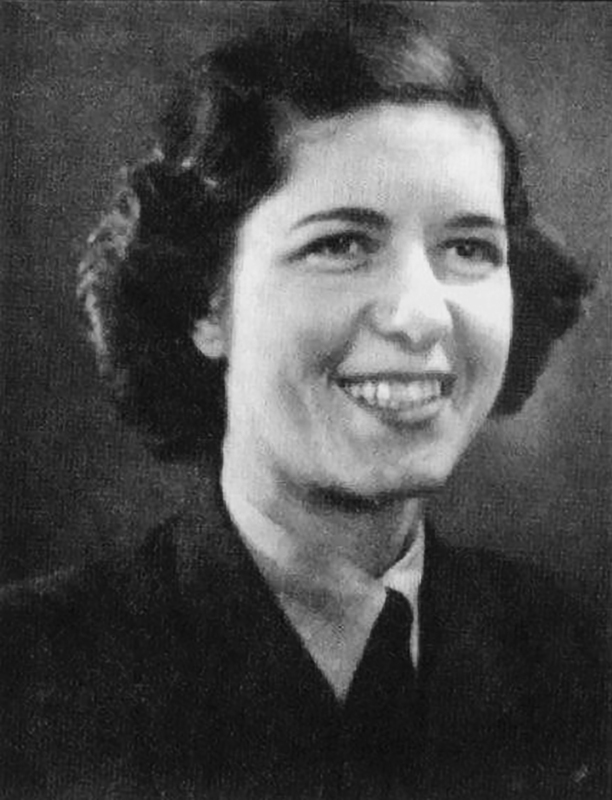 This image of Luftwaffe Experten has remained largely entrenched, and their claiming system, with rigid administrative steps leading up to confirmation is seen as being reliable. 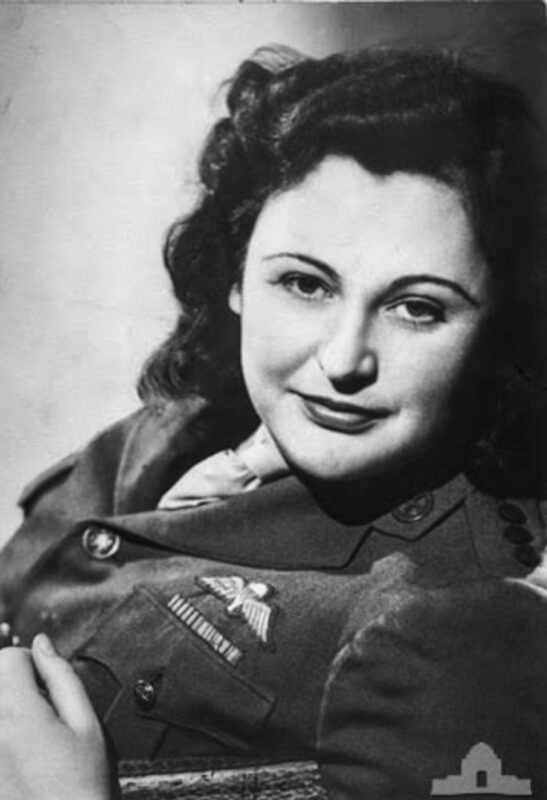 Somehow, the German aces appear as having been better than anyone else a viewpoint still enjoying credence even today; however, it needs to be seen as the propaganda of a race-obsessed Nazi regime, of great benefit when your air forces are suffering strategic defeat, over an ever-retreating Eastern Front. 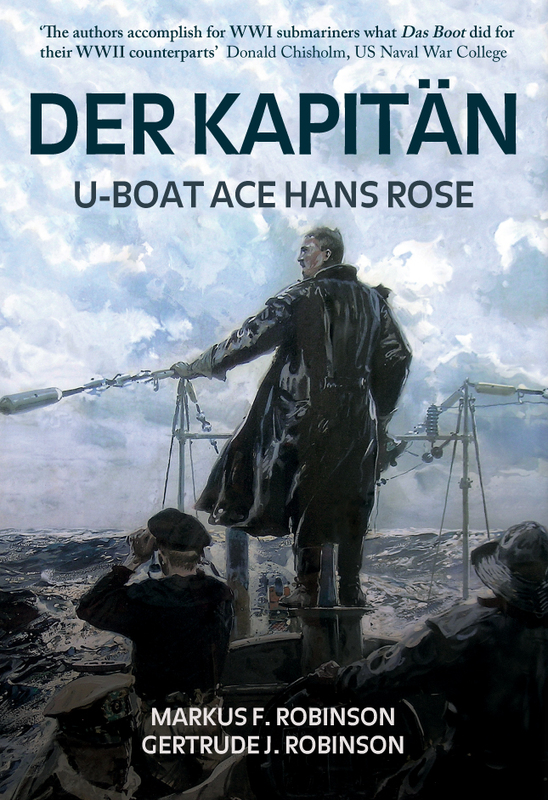 In order to get closer to the truth, this book relies on a core of testimony from 70-odd Luftwaffe fighter pilot veterans who flew Me 109s or Fw 190s, and crewmen of the Me 110 two seater Zerstörer. Recollections of their training period show that it was thorough, unusually included exposure to a wide range of different aircraft types, and was surprisingly accommodating of pilots needing more time for any part of their training. The veterans gave freely of their time, and supplied copies of original documents: flying logbooks, diaries, combat reports, and claims paperwork. Fellow aviation historians were also most generous, one providing the Startkladde 7/JG 51 for September 1943 – April 1944, giving a record of each flight made by all pilots, operational mission or not. This enabled some statistical evaluation of the combat record of a single Staffel over several months. One of the pilots figuring prominently in this record was Hauptmann Gűnther Schack, whose diary excerpts provide fascinating reading of the daily life of a top ace (174 victory claims); he was a very modest man who decried all hero worship of Luftwaffe aces. However, his success and high decorations saved his father (a senior cleric opposed to Nazism and resisted joining the Nazi-sponsored Protestant church) from imprisonment or worse. Oberst Hanns Trűbenbach, commanding JG 52, describes his shock upon landing at a frontline airfield, where an NCO proudly showed him a fresh, only partly covered mass grave of Jewish men, woman and children. 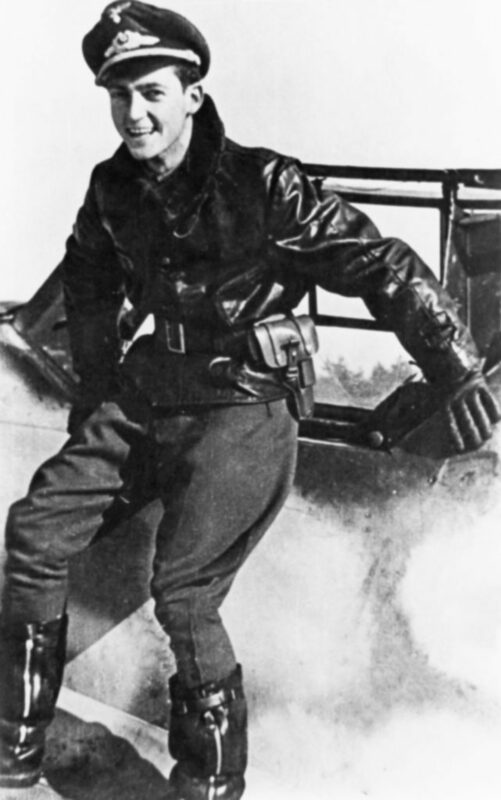 Later on he tells of intercepting a brand new Russian fighter over the Black Sea, whose test pilot was concentrating on writing up his technical notes, and did not see Trűbenbach until he got really close; however, he had nothing to fear, the German pilot had no intention of shooting such an innocent down. Peter Dűttmann, posted into II/JG 52 in the Kuban in May 1943 gives a detailed account of his first few days at the front, during which several of his Staffel comrades were lost, including his C/O; what an introduction for a greenhorn. 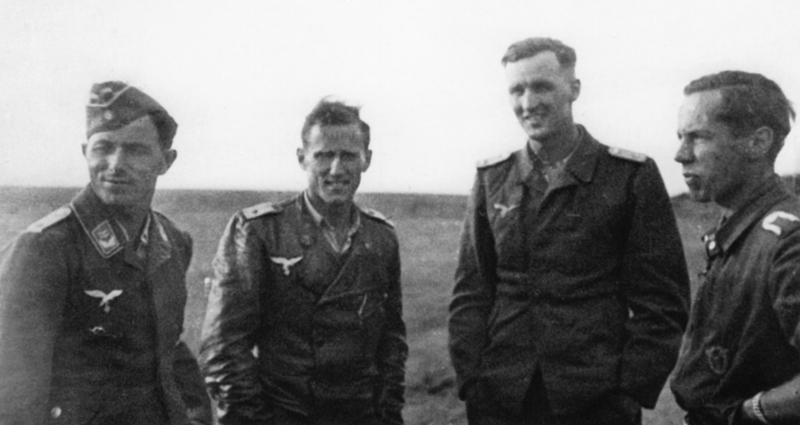 Hans Grűnberg, one of the few surviving members of Platzschutzstaffel Pitomnik, the few fighter pilots of JG 3 flying from within the Stalingrad pocket, recalls sitting in his Me 109 and seeing Russian troops overrun his field base as ground crew struggled to warm up the engine enough for take-off; alas he had to flee on foot in the chaos, eventually getting out the pocket on one of the last Ju 52 transporters to leave Gumrak, a small field several miles away. Other Stalingrad veterans remember not being able to fly tight manoeuvres in combat due to a starvation diet. Diary extracts of Hans Strelow, a very young Leutnant in JG 51 were rescued from amongst his effects after his death by Luftwaffe psychologist, Professor Paul Skawran; forced to crash-land after his final combat, Strelow shot himself in the head rather than become a prisoner. The thorny issue of the Luftwaffe’s multi-step victory claims procedure, often seen as exemplary due to its extensive paperwork, is in fact rather more complex, having also been subject to human influence as in a simpler system. It changed during the war, for most in approximately August 1942, when claims which equate essentially to probables became the norm. A group of Geschwader Kommodoren give detailed testimony about the system. 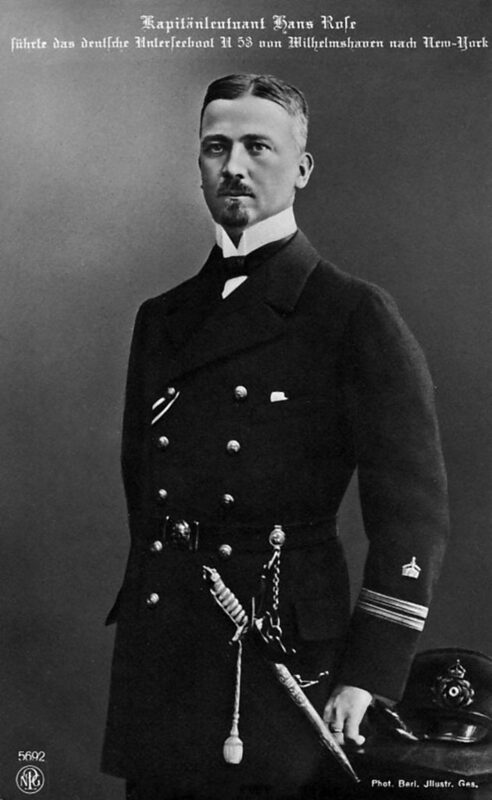 One emphasised the critical distinction between the terms Luftsieg (cf. complete, witnessed destruction) and Abschuss (enemy aircraft leaves formation, descends obviously damaged). 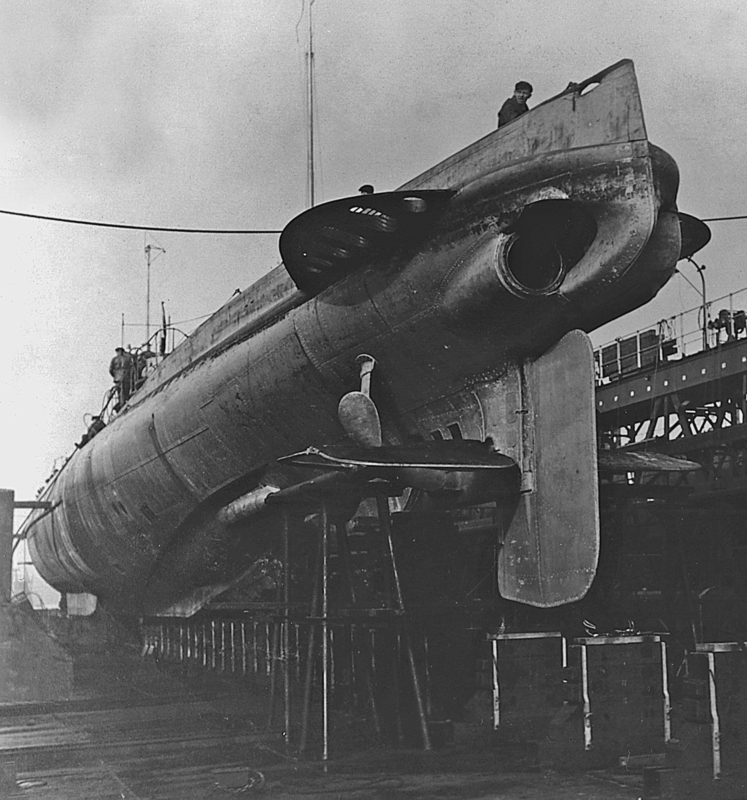 In autumn 1942, the Abschuss concept became basically standard; high claims in the east were acknowledged within a changing and even manipulated system. High eastern scores, can be related to careful use of the Luftwaffe’s favourite bounce tactic, skewed towards enemy fighters; tactical expedience and scoring thus largely replaced strategic application of limited and shrinking aerial assets. 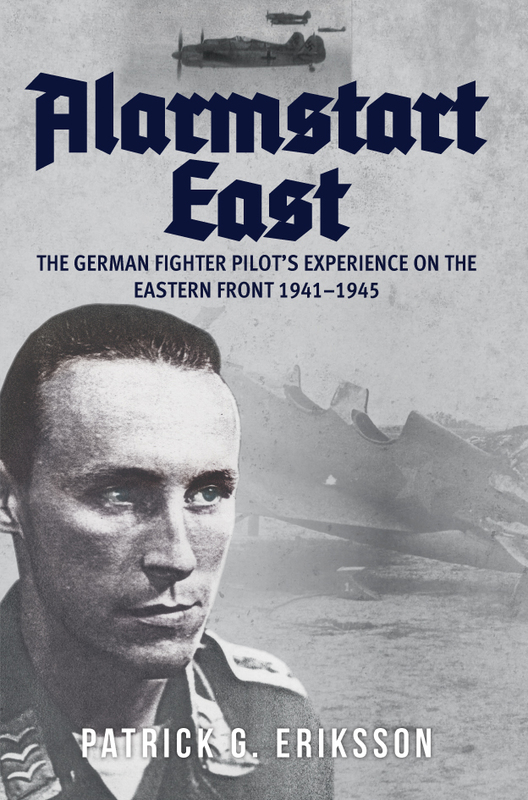 Patrick G. Eriksson's new book Alarmstart East: The German Fighter Pilot's Experience on the Eastern Front 1941-1945 is available for purchase now. This entry was posted in Blog and tagged piloting, Aviation skills, German Fighter Pilot's, Eastern Front 1941-1945, The German Fighter Pilot's Experience on the Eastern Front 1941-1945, Alarmstart East, Patrick G. Eriksson, Alarmstart East: The German Fighter Pilot's Experience on the Eastern Front 1941-1945, Second World War, World War Two, Military History on December 20, 2018 by Amberley Publishing. Chapel Street has long signified the fighting spirit of the ordinary residents of Altrincham. It is regarded locally as a shining example of what can be achieved by such people in times of the nation's greatest need. Many families in the area have strong memories passed on by word of mouth about the individuals who lived in the street and they share pride in its achievement in sending so many men to fight in the First World War. After the conclusion of the fighting a group of residents formed a committee to commemorate those who had served in the conflict, many of whom were of Irish descent. In 1919 this committee succeeded in erecting a street shrine, the Chapel Street Memorial, at the end of the street. 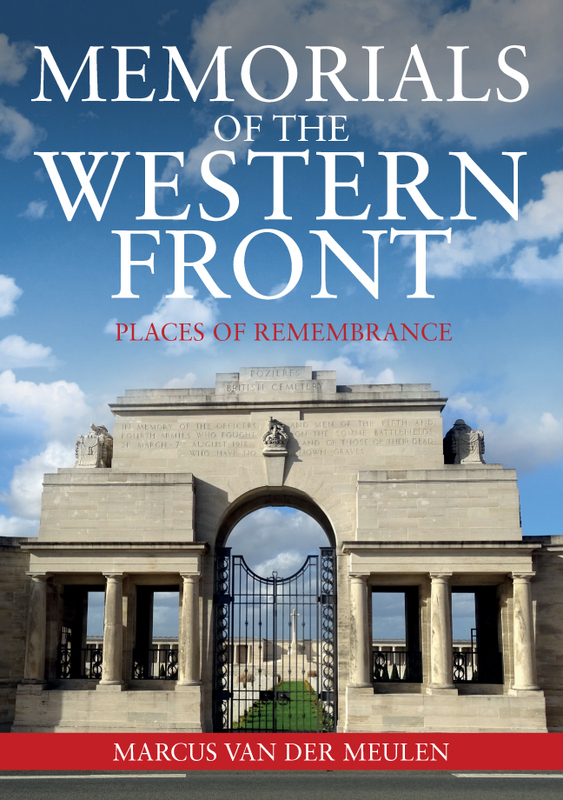 In 2014 a decision was made by Trafford Local Studies to research for a book that would chronicle the lives of as many of the individuals on the memorial as could be located and document them in the social context and history of the street. The big question was how to go about producing a book which would do the subject justice. The work force was already in place. An advertisement in July 2013 for volunteers to work on a First World War research project produced a small team with wide and varied experience and expertise. Local Studies staff set us to work on extracting information about the war from resources in the collection, primarily newspapers and local council minute books. Each item was recorded on record cards and transferred to a database. It soon became obvious that there was a vast amount of material to consider. Labouring through the newspapers produced hundreds of references to Chapel Street from the war years and more from the pre-war and post war years. This research had to be done in short bursts as each edition contained so much information and the small print was hard to read. It took over four years to extract the data and additional material was still emerging up to the final stages of producing the book. The reward was that the names on the memorial became real people as so many interesting stories about the residents were discovered, especially from the reports of the Petty Sessions. 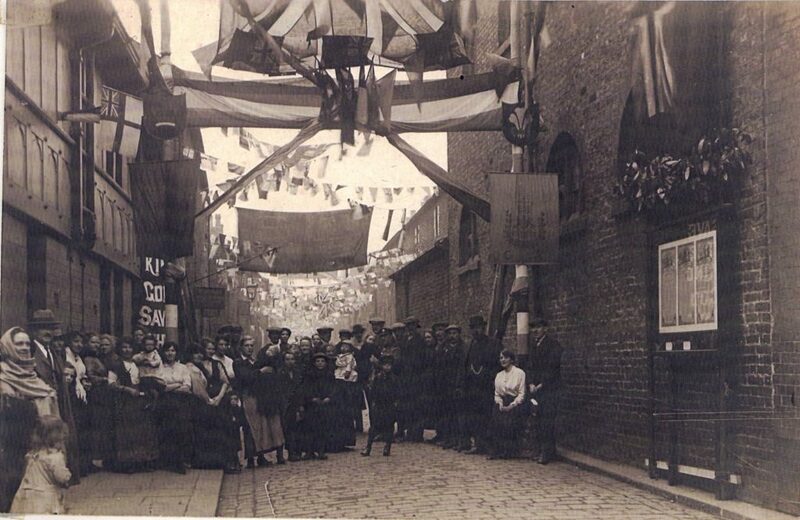 The street contained large families and several lodging houses and were full of colourful characters. Cases of drunkenness, fighting, domestic violence, poaching, and theft, highlighted the extreme poverty in which many residents lived. Some were sad stories, others were amusing, as the case of two of the soldiers who, when they were boys, stole a horse, cart and harness, intending to go to Macclesfield to look for rags and bones. One volunteer used his expertise to record the history and the development of Chapel Street from the earliest evidence to its demolition. Reports and minutes for the local Board of Health provided much detail about housing conditions. Other volunteers used family history programmes and other search engines to research individual lives. The records of birth, marriage and death, parish records, the censuses, the 1939 Register, street directories, army service records, electoral rolls and absent voters' lists were our main sources. Contact with surviving family members produced more information. 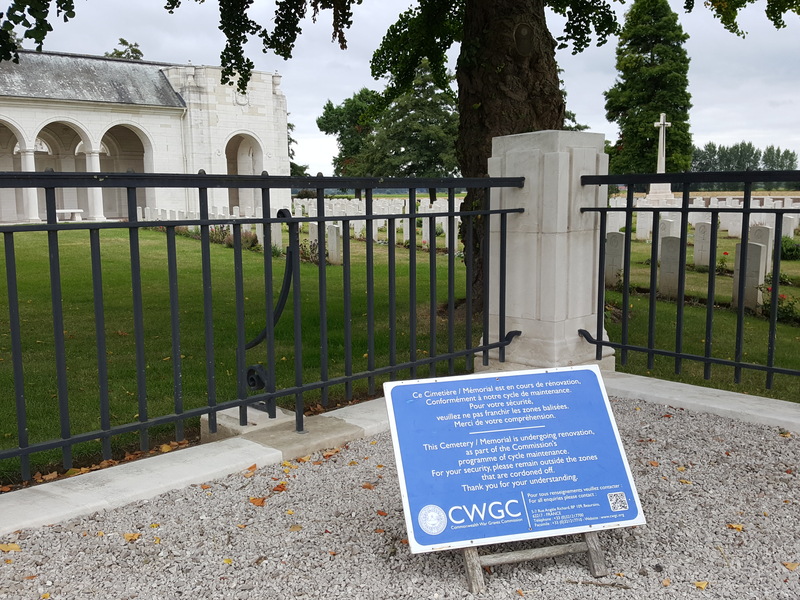 Voluntary work already undertaken to locate and document the lives of Trafford men who had been awarded medals for gallantry had given me experience of interpreting First World War military records. I used this to develop a spreadsheet to record key facts on each soldier so that some statistical analysis could be undertaken once the research had been completed. This work formed the basis of one of the chapters of the book. Some information was located by pure serendipity. It was proving difficult to identify Harry Johnson. Elimination of Cheshire Regiment soldiers of that name had narrowed the field down to one, but there was no conclusive proof. A chance discovery on Facebook of a slide-show of images of the street, with a comment by a friend that her grandfather, Harry Johnson, had lived in Chapel Street, provided the evidence. Her relatives provided a picture of Harry, an honourable discharge certificate, medals and family stories. The medals and certificate confirmed him as the soldier suspected, his obituary was located and it was now possible to write a much less speculative piece about him. During the course of the research there were discoveries which surprised all who worked on the project. 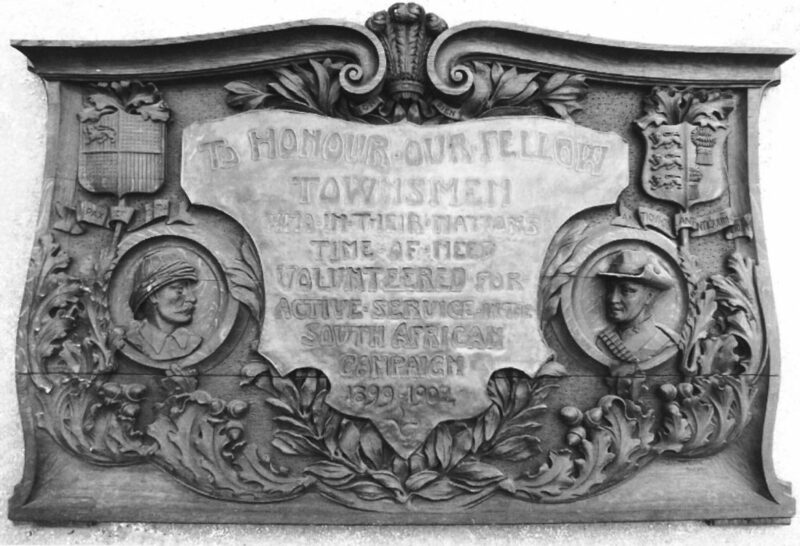 These included evidence that the street had a lengthy history of being an important source of recruits to the British armed services which predated the Boer War. 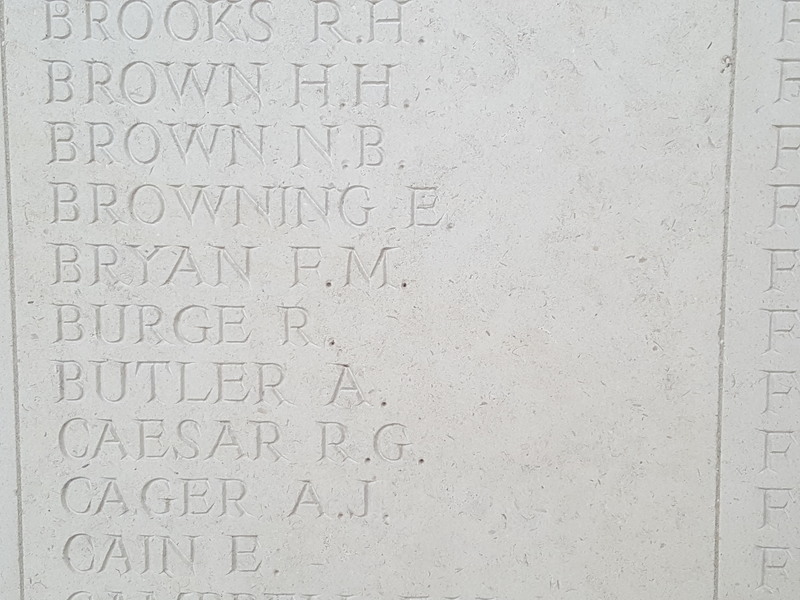 Strong proof was located that the memorial did not include the names of all the men from the street who had taken part in the conflict. More will be revealed by reading the book. The project was expertly managed to ensure consistency. Regular monthly meetings determined the direction of the project and kept us all on track. Folders were created for storing the evidence for each soldier on the memorial. Standardised templates were completed by the team to ensure that all available evidence was collated. These were scrutinised two or three times by different researchers to check the evidence and fill in any gaps. 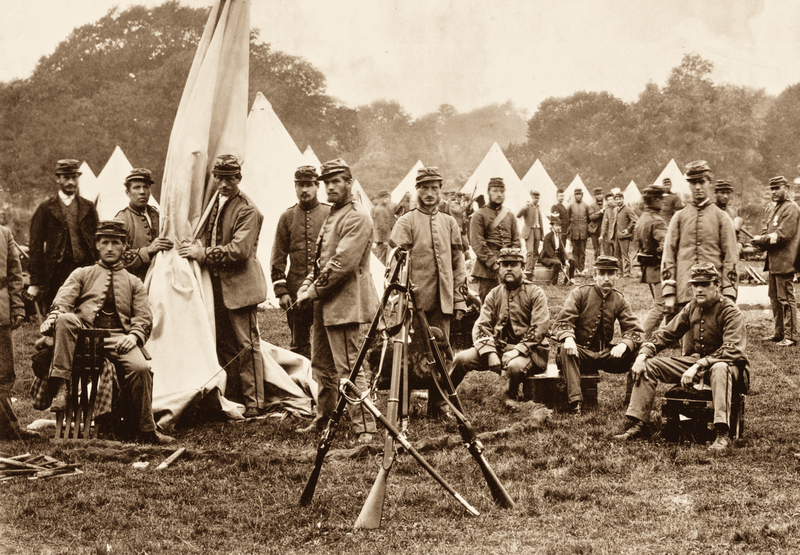 Guidance on style and use of terms, accompanied by model examples, was produced to assist volunteers in writing up the soldiers in a standard format. The resulting biographies were checked to ensure that there was evidence for each conclusion drawn and checked again for consistency in language and format. As each soldier was completed his details were transferred to the fledgling book which rapidly started to grow. Photographs were chosen from the fine Local Studies collection, captions produced and additional chapters written and inserted and, hey presto, the book was completed! 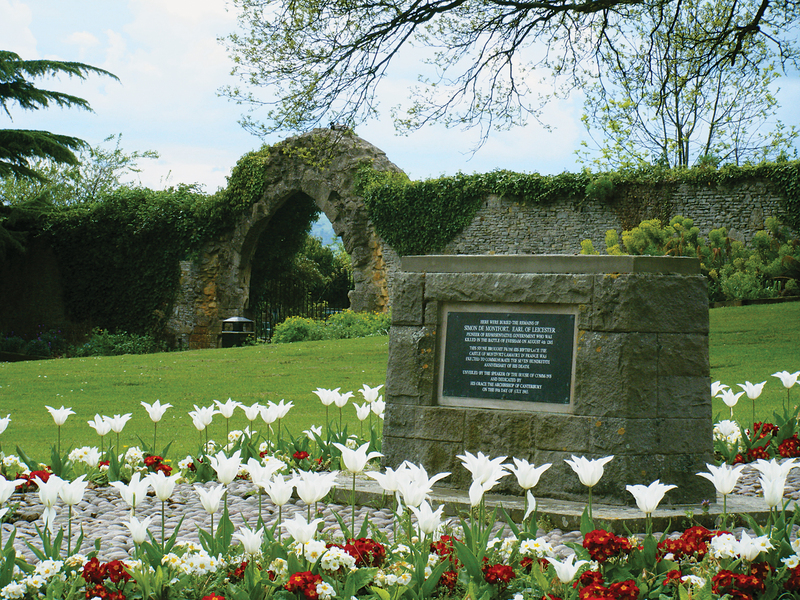 The writing of “The Bravest Little Street in England” has been a most rewarding experience and a fine example of how, with expert direction, volunteers can work together effectively to meet the rigours of publication. 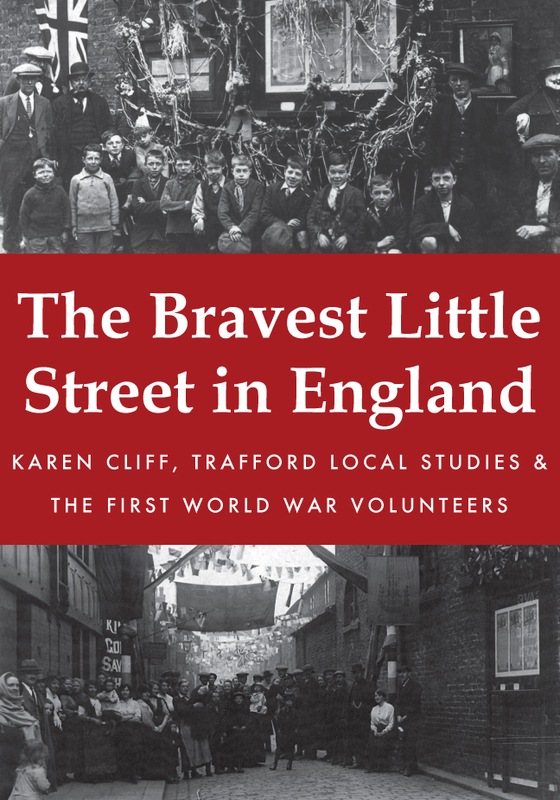 Karen Cliff, Trafford Local Studies and The First World War Volunteers new book The Bravest Little Street in England is available for purchase now. This entry was posted in Blog and tagged Altrincham, Chapel Street, The First World War Volunteers, Trafford Local Studies, Karen Cliff, The Bravest Little Street in England, Memoirs, Manchester, Local History, Military History, Amberley Publishing on October 24, 2018 by Amberley Publishing. When I first thought of this book a couple of years ago I was going to call it Scottish Jihad, for Islamic Jihads were all in the news and I was curious to see how religious fanatics in 17th century Britain compared with those in Al Qaeda. The key difference was that AQ jihadists were mainly indoctrinated to accept the likelihood of a swift death, whereas the rebellious Scots in 1639 had to face the probability of torture and an unpleasant form of execution. Thus the Scottish Presbyterians who felt so strongly about getting rid of bishops were actually tasking a slightly bigger risk than the present day jihadists. Nor could we describe the Scots as radicalised or even indoctrinated for they were for the most part comfortably off ordinary men and women made angry by a dictatorial religious regime dictated from Canterbury. Both sides in the argument were of course Christian and Protestant, so the war they were starting was to be the most serious between two branches of Protestantism and to modern eyes the religious differences might seem quite petty. What makes it all the more significant is that it was this grouping of Scots Presbyterians who fired the first shots in what became the English Civil War or the Wars of Three Kingdoms. 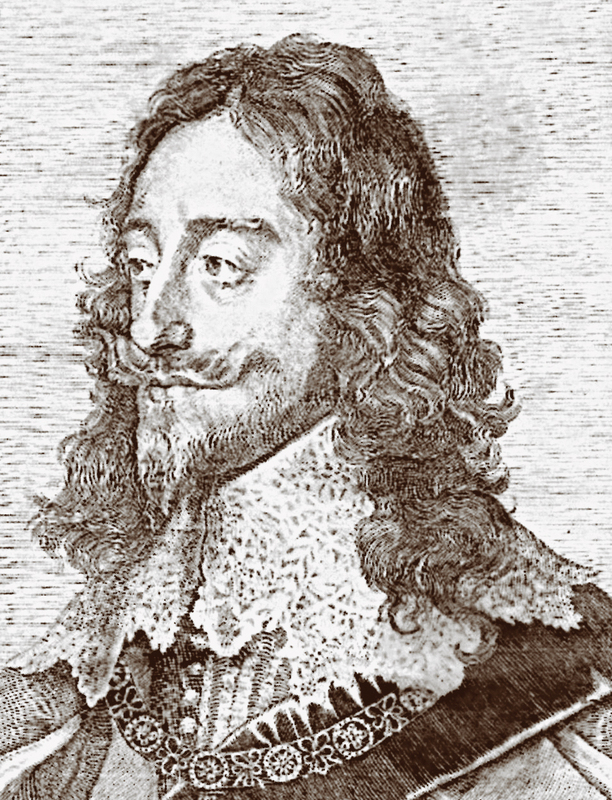 While much is made of the grievances of the English Parliament against the stubborn Charles I, none of the so-called Roundheads took up arms against the king till well after the Scots had done so first. It was these piously angry Scots who, by sending an army over the Border into England, demonstrated that the king’s troops were far from invincible. A gap of more than three years during which the Scots had taken huge risks, humiliated the royal army and made it much easier for the parliamentarians to start recruiting an army of their own. 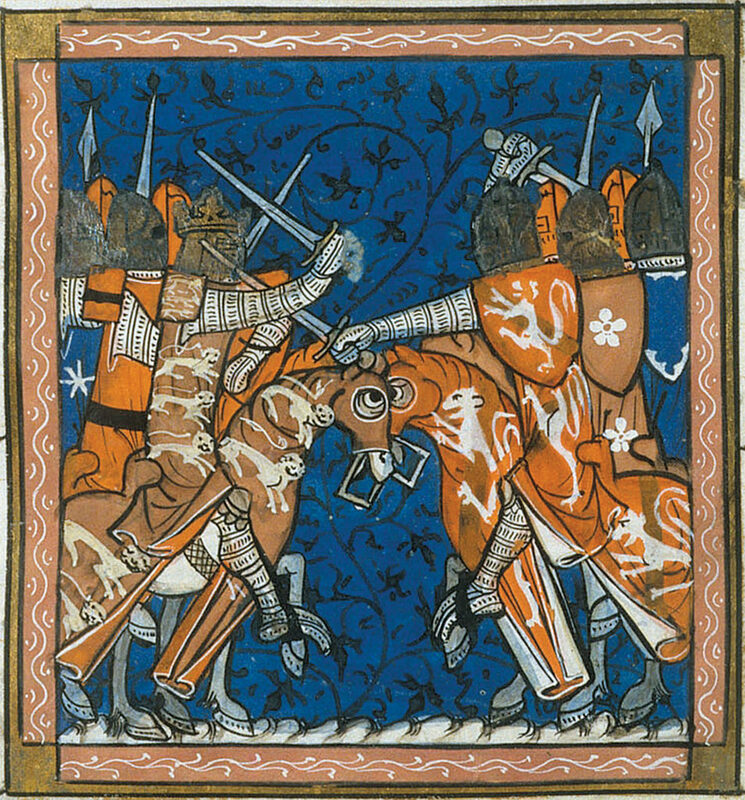 Having spent some time researching the psychology of the horrendous religious wars after the Reformation, the Catholic against Protestant wars in France, Holland and Germany, I was still interested in how this compared with 21st century jihads and the tragic fact that religious differences should lead to so much violence. It was after this that I was on a short walking holiday on the magnificent Fife coastal path that I began to notice how many of the main conspirators who had organised the two Bishops Wars were actually based in Fife and lived so close to each other. So I researched this further. The small Fife ports, particularly Crail, had been heavily involved in transporting ambitious young Fifers across the North Sea to fight as mercenaries in Germany during the Thirty Years War. Many of these men had been remarkably successful, especially the Leslie family which had produced a field marshal, a general and half a dozen colonels, all of them now ready to return home since the Thirty Years War was drawing to a close. Meanwhile the senior member of the Leslie clan, John Earl of Rothes, based in what is now Glenrothes, was taking the lead in a plot to start a rebellion against the religious policies of Charles I. He was thus perfectly placed for recruiting his own relations to form an army and bring in their other ex-colleagues, many of them Fifers, from Germany. The Earl also had a team of extremely able church ministers working with congregations along the Fife coast, all keen to start a rebellion and all well able to motivate the local population. Thus in 1639 Fife had a combination of military muscle, aristocratic support, fanatical churchmen and money that could not be matched anywhere else in Britain. It was thus the Fife Conspiracy that launched Scotland into a series of nine wars and England into three. 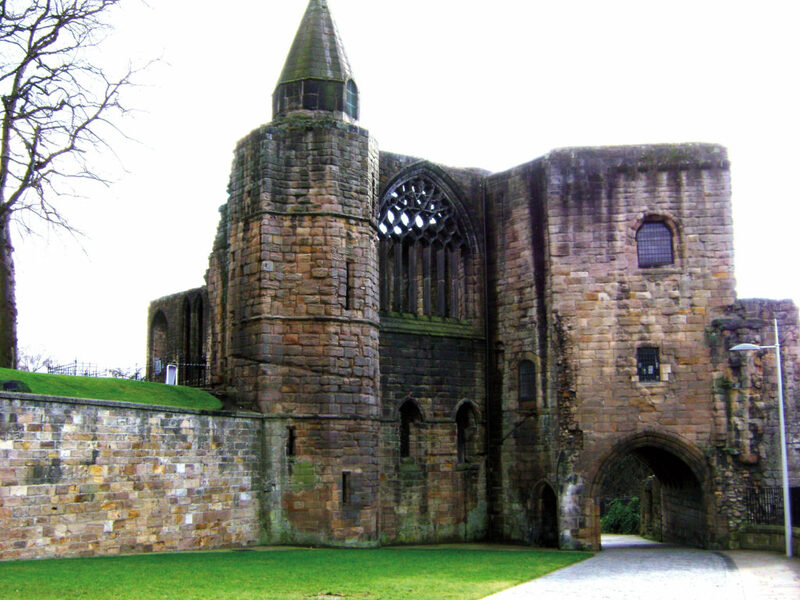 Once the Scottish religious rebellion, the two Bishops Wars, had created the spark for the English Civil War, the affair south of the border became for a time more political than religious. But for the Scots it was still religious which accounts for the fact that in 1648 they changed sides from Roundhead to Royalist with disastrous results. The overall cost in lives for Scotland is reckoned as about 60,000, not counting plague deaths resulting from troop concentrations and harvest trashing. While I was looking at the casualties I accidentally found one that became quite personal. In 1679 Charles II sent an army to crush the Scottish Covenanters in the Battle of Bothwell Bridge on the Clyde. It was a rout and the survivors were marched to Edinburgh from which several hundred were to be transported to the colonies as indentured labour. Their prison ship the Crown of London was hit by a storm off the Orkneys and to avoid prisoners surviving the captain locked them in the hold. Only a few did survive and of those only four avoided recapture. One of those four seems almost certainly to have been an ancestor of my wife, hence the dedication of this book. It’s a small world. 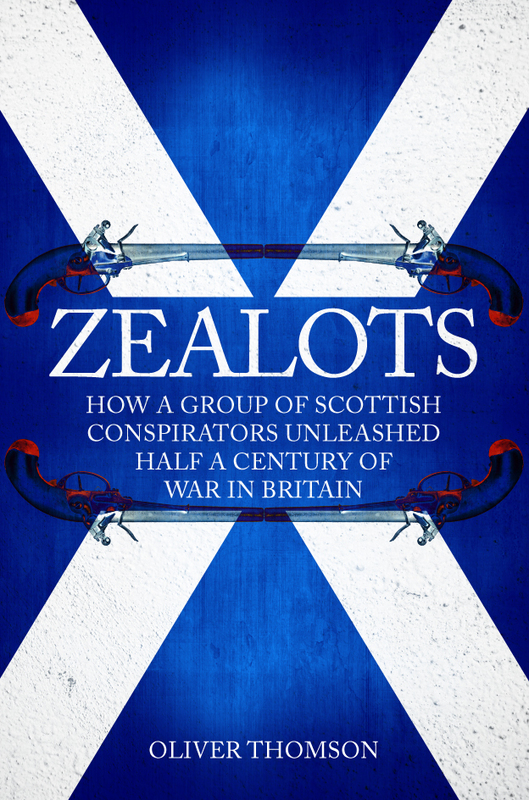 Oliver Thomson's new book Zealots: How a Group of Scottish Conspirators Unleashed Half a Century of War in Britain is available for purchase now. 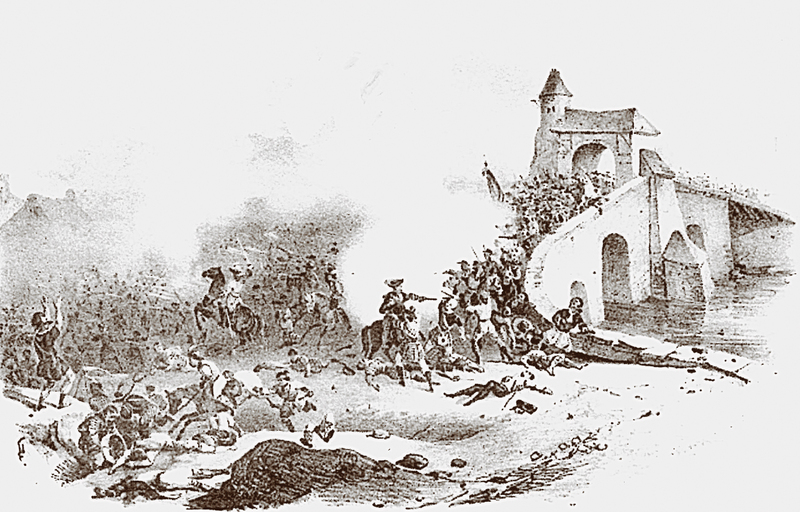 This entry was posted in Blog and tagged Military History of Strategy, War & Defence Operations, England, Religion, How a Group of Scottish Conspirators Unleashed Half a Century of War in Britain, Oliver Thomson, Zealots, Scotland, Military History, Amberley Publishing on September 5, 2018 by Amberley Publishing.